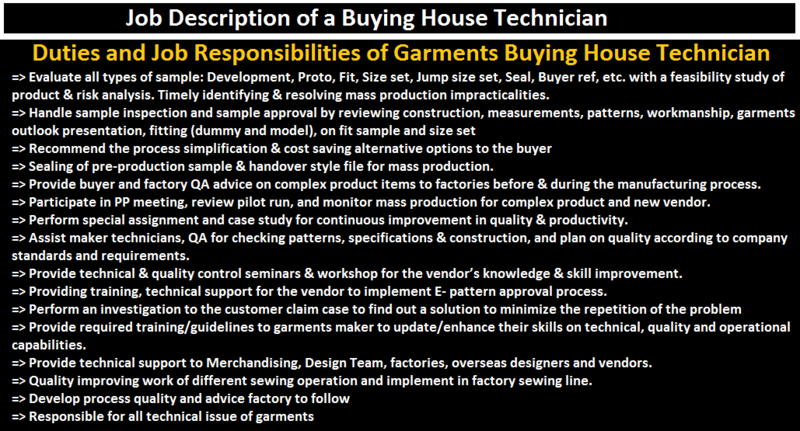 Home » Posts tagged "Job Responsibilities of Garments Buying House Technician"
Buying House Technical Team: A buying house technician is a person, who is responsible to evaluate/review all types sample, make comments and approve or reject all types of the sample from buyer end. The person is also responsible for sample quality, works to improve sample and bulk quality, guide factory to improve quality. A buying house technical team consists of technicians where they know all types of Technical thing of a Garments factory. Here in this article, you will have detail idea of Duties and Job Responsibilities of Garments Buying House Technician. In a job description, all the duties and responsibilities are clearly disclosed. Evaluate all types of sample: Development, Proto, Fit, Size set, Jump size set, Seal, Buyer ref, etc. with a feasibility study of product & risk analysis. Timely identifying & resolving mass production impracticalities. Sealing of pre-production sample & handover style file for mass production. Provide buyer and factory QA advice on complex product items to factories before & during the manufacturing process. Participate in PP meeting, review pilot run, and monitor mass production for complex product and new vendor. Assist maker technicians, QA for checking patterns, specifications & construction, and plan on quality according to company standards and requirements. Provide technical & quality control seminars & workshop for the vendor’s knowledge & skill improvement. Providing training, technical support for the vendor to implement E- pattern approval process. Provide required training/guidelines to garments maker to update/enhance their skills on technical, quality and operational capabilities. Provide technical support to Merchandising, Design Team, factories, overseas designers and vendors. Quality improving work of different sewing operation and implement in factory sewing line. Develop process quality and advice factory to follow. Responsible for all technical issue of garments. Generally, we can find the following types of designation in buying house technical department.